You’ve participated in a reader’s choice for best lakorn in 2013, and with the combination of unlimited voting- and obviously lots of refreshing and re-voting- you have given one particular lakorn the trophy: Exact’s Sud Sai Paan starring Vill Wannarot and Toomtam Yuthana with a total of 1,404 votes. So congratulations Sud Sai Paan fans, may your computer thank you for the closure of this poll. Suparburoot Juthathep Series came in second with 574 votes and Nuea Mek 2 won third place! Complete with a double take! We are talking about a controversial lakorn that never got its finale aired, really, the first in primetime television. But the people have spoken and I thank you for your voice. 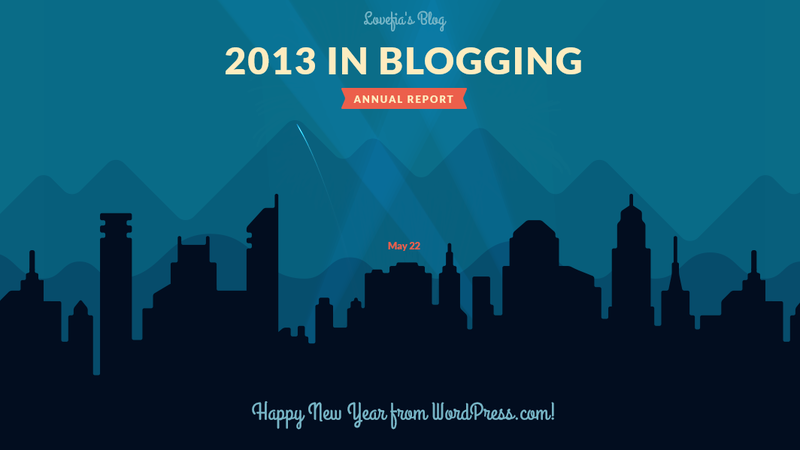 Before we leave 2013 behind us, I would like to share some significant blogging milestones and stats to aid in this reflection. I certainly didn’t start blogging for numbers, and my fellow bloggers would probably agree that blogging is fun when we write about what we want to write about. Sounds intuitive right? But it’s not always easy to accomplish, because it can start out being rather scary. You’re putting yourself out there, your thoughts, perspectives (and need I say outrage) to the world wide web. Will people agree with you? Are you over thinking it? Will they hate what you have to say? Heck, would they even care? But the more I write about what I love (which is the lakorn and other drama world) the easier it is to push the publish button, and the easier it is to accept that my articles aren’t perfect and that I’m okay with it. As much as striving to be relevant and blogging about the hot topics, or topics you think people would like to read can help your blog be more successful, I think that being transparent and sharing a piece of your mind with the world is equally rewarding and keeps one a’ blogging. So with that being said, I’d like to thank all of the readers near and far who have subscribed to this blog, frequented this blog, and have shared their two cents about the myriad of topics discussed this year. Oh and especially, for sharing your love of lakorns with me. Mon Jantra Ep 4 has the most read this year! Well, my poor Gentlemen Series review unfortunately did not make the cut. Thank you, Lady of Darkness! 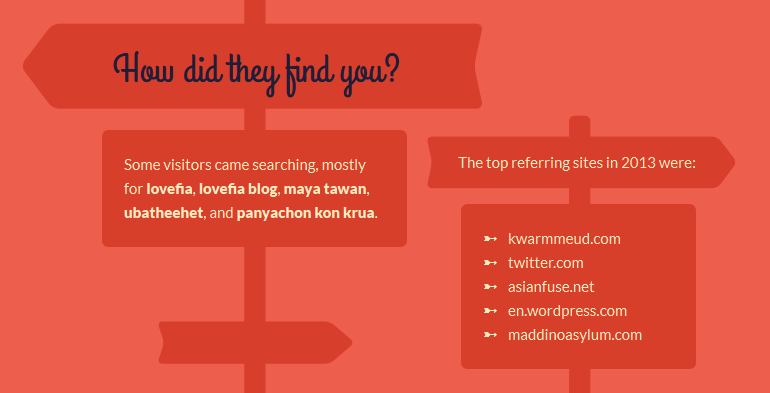 And of course, all of my wonderful fellow lakorn bloggers for spreading the lakorn love. Special thank you’s to my top five commenters. You certainly know how to party. I wish you and yours a prosperous new year. Cheers to an adventurous year ahead, and happy lakorn viewing, reading or blogging- whatever it is that you fancy! Omg… Way to go Sud Sai Paan lover!!!! Thanks for all your hard work writing reviews, recaps, updates, etc. I know I don’t get to comment as much as before to thank you for your hard work, but just wanted to let you know I’m still reading, following, and loving your blog! All the best for your life and work in the new year! Happy New Year 2014! Thanks for “A year in lakorn blogging 2013”. It brings back all the joys, ravings and rantings of watching lakorns together with you. Looking forward to more fun this year! Your blog is the bestest of the best blogs on lakorns. Thank you from the bottom of my heart! wow, i did not expect to come in as number 3 but…..HAPPY NEW YEAR’S!!!!!!! 2013 was a good year for lakorns for me and 2014 looking just as good. can’t wait for Cubic, pope’s new lakorns as well as tik and anne’s. love me some toomtam and can’t wait for his upcoming lakorns koom nang kruan with pinky and mo, and ngao jai with view as nangek again!!!! I hope you gain more frequent followers to your site because I love your posts! May you have success in all you do in 2014!! i wanted to ask….does anyone know if someone is subbing or capping the channel 7 lakorn wimarn maprao starring cheer and thunwa? Ahhh loved vill and toomtan! !